In fourth grade I fell in love with my teacher. No not a crush on a male teacher, but a true admiration and respect and love for my 4th grade teacher, Mrs. Curry. I loved all my previous teachers from Kindergarten through third grade, but not the same kind of love I felt for Mrs. Curry. She was the first teacher I had that really loved what she did. Being a teacher. I may have been a child, but I knew she loved being a teacher. And I loved being her student. She inspired me so much that I wanted to be a teacher. I did go on to get my degree in education. Although I never took an actual teaching position (only substituted), that’s a story for another time, I knew teaching was an important and loving, selfless job. I’ve been blessed with wonderfully dedicated teachers in my life, from elementary through college. And my son who is just finishing up elementary school has been equally blessed as well. In fact, the school he attends is full of amazing teachers. He loves every teacher he has had so far, but his two favorites were his 2nd grade teacher, Ms. Sanford, and like me, his 4th grade teacher, Ms. DiMeola (pictured above with my son after his performance in “Sarah Plain and Tall” at our local children’s theatre). They both lit a spark in him. They both took an interest, even coming to see him in things that were not school related. Taking their precious spare time to see him, meant the world to him. Teachers change lives. I’ve seen it first hand. I’m sure you’ve heard stories of how just one teacher made a difference in a child’s life. Maybe your life was affected by a great teacher, too. She is a teacher at an alternative high school in Utah. This is the last stop for students before dropping out. Cassie is a former drop out who went on to earn her Masters Degree, and wants the same for her students. She gives them a second chance, and a new way to look at learning. I bet you know a teacher who has spent their own money out of their own pocket every year. I know countless teachers that do. And teachers that are doing innovative things in their classrooms every single day to inspire their students. Teachers like my 4th grade teacher, Mrs. Curry and my son’s 4th grade teacher, Ms.DiMeola, and in the video above, Ms. Cox. 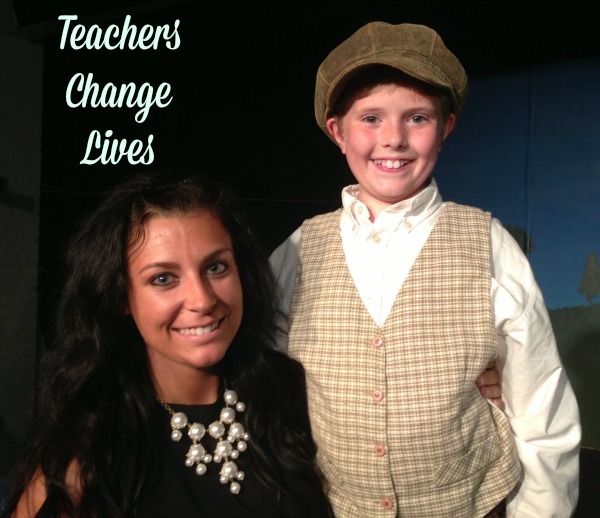 If you believe teachers can change lives, you can help! You can help these teachers that are doing innovative things in their classrooms every day by donating. You can donate to the teacher highlighted in the video, or a teacher in your local community! Adopt-A-Classroom is a nonprofit organization that helps connect donors with teachers to enhance the learning environment for students. Office Depot and Adopt-A-Classroom have partnered to raise awareness about teachers, and all that they do in the lives of their students. Do you know a teacher that changes lives? I am a teacher and I truly love when companies support teachers and all of their hard work. Kudos Office Depot! A good teacher really can make a huge difference for students. I had a couple who were really wonderful for me too! Thank you! My daughter-in-law is a teacher. We donate to her classroom every year. She buys a lot for her classes, and most teachers do. Even more than most people could comprehend. This is an awesome project! This made me think of the teacher who made the most impact on my life. And yes, those great teachers put so much of themselves into teaching that the least we can do is help them out. It is nice to see that some teachers truly have that passion to help shape children’s lives. I have a few that really stood out to me when I was younger!! I think its great when kids adore their teachers and I think it is a parents responsibility to foster a good relationship with their children’s teachers. For some weird reason if I really liked a teacher and told my mom about it, she got really upset and took it personally. I really want my son to love his teachers and love learning. Its really the best thing for kids! I too “fell in love” with my 8th grade teacher, and to this day, from becoming an awesome mentor to me, to now just a good friend, we still get together for lunch or just to catch up. She adores my kids. Its a great relationship. A great teacher is really hard to find, so far my kids have not found that special one yet. I had mine in 3rd grade, Mrs. Lowenstein.. she was the best of the best. This sounds really wonderful, and I agree, teachers have so much impact! Good teachers really do make a big difference! I’m glad my children having amazing teachers! Its sad every child doesn’t. You never forget those special teachers in your life! I had a horrible time in school but 3 teachers stood out and if it weren’t for them I never would have graduated. Teachers are amazing. This Is Awesome I Think Teachers Get Eough Credit Where It Is Due I Am Always Trying To Help Out With Supplies & Just Saying A Simple Thank You Once In A While!! I always loved my teachers. Teachers can make a huge difference in a child’s life. Teachers can change lives. I homeschool my daughter and I hope the teaching I give to her will change her life. I also spent a good portion of my life preparing to become a teacher, but like you things didn’t go as planned. Unfortunately, I don’t have any good schools to send my kids to. So, I do homeschool my three kids. (I wish they were in school for the social experience if it wasn’t so dangerous for them! Plus I would love to be able to dedicate more time to actually working on my blog than what I get.) However, homeschooling is also a huge blessing in many ways and on our good days I love it! My music teacher in elementary school really made a difference in my life. I actually was encouraged to get involved in choir and ended up continuing through till I graduated. I love this article. Teachers are so often under appreciated and acknowledged. What a wonderful tribute to teachers everywhere! My children’s teachers have all gone above and beyond. It’s hard to show sufficient appreciation for that much caring. Being a teacher takes a lot of character. I wish the society would give a little more credit to it, in monetary form also. I’ve had quite a few teachers who changed my life. One of them pushed me to be a better writer and the other inspired me to teach, which I’ve done in some capacity and plan to do for real once my boys are grown. It’s great that they are making it easy to donate! I totally agree! My mom is a teacher and I love how much she impacts kids’ lives. This is a great program! My son is only in pre-k but loves his teacher. I can’t wait for him to experience the admiration of his teachers as he gets older! I have never heard of this before, thanks for sharing!! I can’t wait to look into it. My husband is a teacher so I love things like this. Teachers are such an important part of growing up. We should appreciate them more. This is a great thing office depot is doing. My sister-in-law is a teacher, and she is always spending tons of money out of her own pocket (that her family of four could really use) to buy supplies for her class. She even buys the whole material list for kids who can’t afford it at the beginning of each year. I honestly was not aware of this program, but it sounds amazing! I sit on an education board and this is something that I will definitely share and pass along! I am 27-years-old and still remember my 1st grader and 6th grade teaches. I also had two teachers in high school who were really encouraging. They did shape part of who I am today! I still remember the teachers who made a positive impact on my life, and I’ve got a grandbaby now. That kind of stuff just sticks with you. My 4th grade teacher changed my life. She was the sweetest person. I did a charity program for a business like this once and it was SO rewarding. Even now I still think back to some of the lessons my teachers taught me. And not just academics – life lessons as well. Teachers definitely make a difference! Awesome! I’ve always felt teachers are under appreciated, so I’m glad to see a major company supporting them. A good teacher can definitely make a difference. I have four children in school and have good luck so far with teachers. I am not looking forward to my daughter changing teachers, she has had the same one for 4 years now. There are a few teachers that really made a difference in my life. Even better is watching my children encounter teachers that make a difference in there lives. There are so many but they’re still hard to find. Either that or they get burned out from lack of support. Great initiative and I’m so glad Office Depot is partnering with this to draw positive attention. There is one specific teacher that stands out because she was so nice and had such a great personality. I don’t have one teacher that inspired me but I had great teachers. I had quite a few teachers in my past that I loved. So far I’ve loved all of my son’s teachers. I was not so fond of my daughter’s kindergarten teacher, though. Having said that, though, she gives her time for these kids and I’m sure her own money. Teachers deserve help! I’ve always wanted to become a teacher. I guess it’s not too late..
We’ve been our daughter’s teacher for the last 6 years, and are ready to graduate her this year! But for the first 7 years of school she attended public, and her second & fifth grade teachers were the most incredible women who truly loved what they did and poured themselves into the students in their classrooms. Her 5th grade teacher even won the state teacher of the year award the year our daughter had her! This is a great program. It is a shame that there has to be such programs. Teachers shouldn’t have to pay out of their own pockets but I know a lot of them do. I have had a few great teachers in my life and so have my kids. I always commend them via consistent thank yous and gifts since I know how tough it must be to deal with so many children! To this day I still remember the teachers that really helped me along in school. They DEFINITELY change lives.